Because all of your patients are different, Walgreen Health Solutions has always made a point of assuring that Heelift brand boots are customizable. But customizable boots are just the beginning. Fluid-repellent, soft and aids in proper foot position. Available for patients with edematous legs and other serious injuries. Creates increased ventilation for patient legs. Offloads pressure from the heel and redistributes pressure to the calf. Easy-to-use soft straps can be adjusted to accommodate the patient. Aids with mobility and prevents the boot from buckling. Our Heelift Products completely offloads the heel with a lightweight boot with a semi-regid brace and outer lining that provides the correct fit for foot drop prevention and treatment while being comfortable to wear. Since its introduction in 1979, Heelift Classic has helped millions of patients prevent and treat heel pressure ulcers. Over the last few decades, the Heelift Classic and Heelift Basic have allowed facilities to shift their focus from expensive treatment methods to safer, more economical prevention strategies. Forefoot support; spring back technology helps to keep the foot upright. Heelift Traction Boot provides an inventive method of applying skin traction to help stabilize femur fractures prior to surgery and to help prevent heel pressure ulcers after surgery. With up to ten pounds straight skin traction for fracture pain relief, latex-free Heelift Traction Boot helps prevent heel and lateral malleolar ulcers and avert peroneal nerve pressure injury at the fibular head, as well as providing forefoot support to avoid heel cord contracture. During the pre-surgical period when the patient lacks the ability to control the leg, Heelift Traction Boot elevates the leg and controls foot drop and rotation. Added stitching narrows the forefoot and increases support to provide improved protection against foot drop, equines deformity, or heel cord contracture. After surgery, the side traction straps, traction bar, and rope can be removed, converting the Traction Boot into a Heelift Classic Boot to help prevent pressure ulcers. Allows the leg to glide easily across bed sheets and under covers. A longer forefoot area helps protect toes. Keeps the heel offloading boot in place and helps support the forefoot. Heelift Glide is the result of 35 years of research, development and refining to create the most innovative and effective heel offloading boot for heel pressure ulcer prevention ever offered. What makes Heelift Glide so unique? A soft, smooth exterior fabric allows the patient’s leg to “glide” from side to side, thereby preventing it from catching on sheets and blankets. Heelift Glide Ultra and Heelift Glide boots move easily over the sheets, which helps keep them in place. That means fewer adjustments and less time spent reapplying the boot. The comfortable design means better patient compliance and fewer patient complaints. They are easy to clean — both boots are washable and the interior of Heelift Glide Ultra can simply be wiped clean. Durable, Yet Soft, Smooth Exterior: Allows the patient’s leg to glide easily across the sheets. Forefoot Strap: Keeps the heel offloading boot in place and helps support the forefoot. Friction-Free Tricot Backing: Unlike products with sharp edges, Heelift Glide, like all Heelift offloading boots, is manufactured with a smooth tricot backing that aids in patient mobility and safety. Tricot Covered Stiffener: Prevents Heelift Glide from buckling. Ventilation Holes: Provide additional air circulation to promote increased patient comfort and a cooler heel offloading boot. Glide is 40% lighter than pillow-style boots. “Easy-on, Easy-off” Rounded Straps: Easy to use, the soft straps can be adjusted to accommodate the patient’s specific needs. Choice of Two Interiors: Heelift Glide is available with a choice of two foam interiors. Smooth foam is available for patients with edematous legs while convoluted foam creates a cooler offloading boot. Extended forefoot: A longer forefoot area helps protect toes. Deluxe exterior stitching: Reinforces the structure of the heel offloading boot while making the boot less bulky. Washable/Autoclavable: Like other Heelift products, Heelift Glide can be washed safely in a net or mesh laundry bag and can be autoclaved for sterility. Heelift Glide is indicated for patients who are at high risk for heel pressure ulcers or who have experienced pressure ulcers in the past. 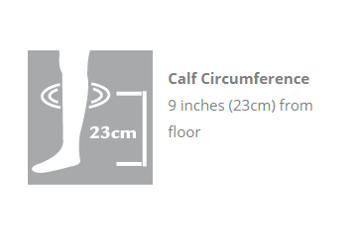 Heelift Glide can play an integral role in offloading the heel to help prevent heel pressure ulcers. Unlike pillows, which can actually aggravate heel cord contracture, Heelift Glide assists in keeping the patient’s foot in the correct position for heel pressure ulcer prevention. Compared to pillows and other heel offloading devices, Heelift Glide can also save a lot of nursing time. Because Heelift Glide “glides” across the sheets, the patient’s foot will stay in place even better than it would in other professional offloading devices. This not only provides more effective care for the patient, but it also means fewer adjustments and less time spent reapplying the boot. "This product is superior to any heel protector our facility purchases. I will be working closely with our purchaser to purchase more Heelift Glides. Thank you." "Heelift Boot was easy to use and patient's wound went on to completely heal with its use. There was a problem with pressure to the posterior heel prior to use and redness went away, as did the pain." "…have been offloading with pillows so it (Heelift) is less work for the caregiver"
"(The boot) stayed in place; can use in bed or in scooter. Most important, heel ulcer healed after one month of Heelift being put on patient. Patient still wearing (the boot) for prevention." Simple instructions with Visual Examples of How to apply Heelift. STEP ONE: Place foot inside the boot with the heel resting above the heel opening. STEP TWO: Thread straps through D-rings and secure the straps. APPLY THE STRAPS LOOSELY. STEP 3: Test the fit under the heel opening and under all straps. The straps should not be touching the skin. To HAND WASH: use mild cleanser and warm water. To SANITIZE after washing: use an antiseptic spray. To STERILIZE: Keep the straps loosely affixed, use standard protocols with a steam autoclave. Allow a few hours to cool and dry completely. 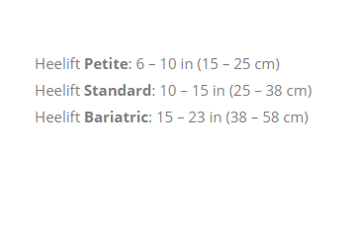 Heelift AFO, Glide and Classic all include a spare elevation pad to facilitate customization. Heelift AFO Ultra and Glide Ultra boots have a removable elevation pad cover for this very same reason. 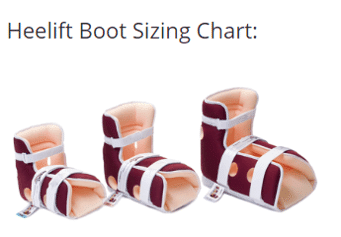 Every Heelift boot is ready to use right out of the bag, but if required, can also be customized to suit your patient’s unique needs. Achilles Tendon: If redness occurs in this area, cut a “V” shape out of the fixed pad. If using both pads, customize the upper pad. Malleolar Decubitus: Cut away foam on the fixed pad surrounding the ankle as needed. Cut the spare pad in half and place it along the inside of the boot increasing protective space around the injury. The Anti-Rotation Wedge gives you the flexibility needed to stop rotation in immobile patients. The easy to apply, reusable wedge attaches to either side of the boot, and prevents rotation. Foot Rotation: Cut the spare pad lengthwise. Remove adhesive backing and attach the spare pad in a horizontal position along the inside of the boot parallel with the leg. SCD and Heelift Boots: Apply the boot normally with the SCD sleeve and place the tubing so that it exits out of the opening as shown. In relation to pressure ulcer development, microclimate is a term used to describe two aspects of the interface between the skin and a support surface – temperature (of the skin or the soft tissues) and humidity or skin surface moisture at the interface between the skin and the support surface. There are a few features of Heelift® Brand Boots that help create the desired cooler, drier microclimate that prevents pressure ulcer development. As the above cut-away shows, Heelift® completely offloads the heel, allowing heat and moisture to escape so long as the patient is turned regularly. Additionally, the ventilation holes found in the Heelift AFO, Heelift Glide, and Heelift Classic further help the flow of heat and moisture. In a recent study published in the Journal of Tissue Viability, Amit Gefen PhD. Dept. of Biomedical Engineering wrote, “There is increasing evidence that thermodynamic conditions within and around skin tissue strongly influence the susceptibility of skin to SPUs (Superficial Pressure Ulcers)…” Successful pressure ulcer prevention depends upon a complex balance between two sets of parameters — the external loads applied to the skin and soft tissues, and the intrinsic ability of the skin and soft tissues to withstand prolonged or excessive loading. If the intrinsic resilience of the skin and soft tissues deteriorates, pressure damage is more likely to occur. Hence, a full understanding of a patient’s conditions, and immediate environment, including anything that may cause the patient’s skin to increase in temperature or moisture should be considered. To determine how effectively Heelift Glide and Heelift Classic Boot help create a cooler, drier microclimate for improved pressure ulcer prevention, the boots were tested by two different third-party research groups. The first study was conducted by Evan Call’s team at Weber State University. A heated indenter, modified to release water vapor, was inserted into the Heelift® boots and microclimate was measured using temperature and humidity sensors. The second study was conducted at the North Carolina State College of Textiles Textile Protection and Comfort Center (T-PACC). This study used the North Carolina State University sweating foot manikin system. Visit our white paper page to download the white paper titled, “Why Open Cell Foam is the Best Material for a Heel Offloading Boot” to learn more about the results of that study as it relates to pressure ulcer prevention. A simple algorithm to determine which boot works best for the patient. Determine which Heelift boot works best for patients that are at risk for heel pressure ulcers. Which products will help you fulfill your pressure ulcer prevention protocol? These handy visual guides will let you know. Explanation of Heelift clinical superiority, demonstrated cost savings, superior microclimate, product efficacy, our products, support for clinicians & facilities, and product support. The PressureAlert® system enables healthcare providers and patients to prevent and heal wounds. Its’ patented technology monitors the amount of pressure and time a patient is on a particular high-risk area of the body.